I haven't told you enough lately. I forget that I'm not the only one that needs to hear it. I get so wrapped up in my here and now that I fail to remind you. I get scared sometimes, too. I get that feeling that no one cares what I have to say and no one wants to listen anymore. And I forget. So, you know how I get off my train of thought very easily...this time I'm going to try my hardest not to. Today I'm going to tell you what I want to hear. I just want to put my brave on and give you those words as well. I know you get scared sometimes. I know you have secrets that you bury inside of you. I know that sometimes you want to get on the roof somewhere and scream out to the world. I know you get frustrated. I know you hold your breath sometimes hoping everything turns out okay. I know that as soon as you exhale from that tightly held breath, you'll feel better. I know that you pray. You pray for grace and wisdom and everything in between. I know that deep down inside of you, in that little space no one knows about, is this girl - this woman - with so much to say and give. I know this because we are friends. Friends know the potential in each other. We know when to stay silent and just listen. We know that we can't judge each other, but just stand by each other in the good and the bad. A friend sees that spark. 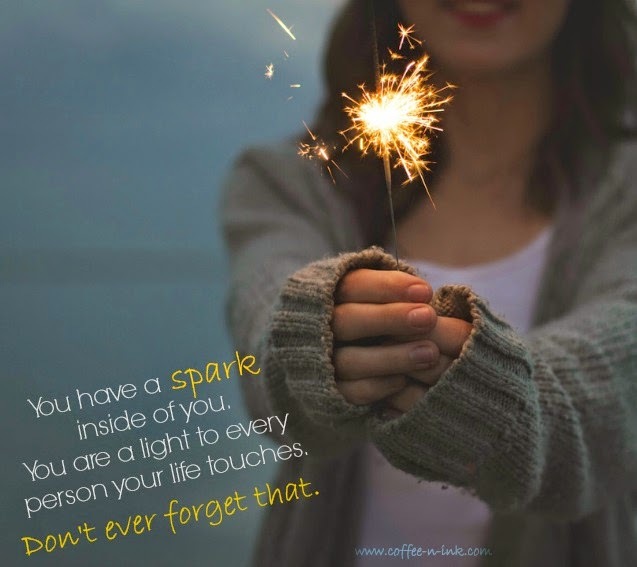 It's inside and gives light to everything you touch because you're so freaking special. You know that, don't you? You rock each and every day just by living. You inspire people. You make a difference without even knowing it. How do I know this? I see it. I see you. You show up. Shine. Repeat. Even on your bad days - yes, even on "those" days. People miss you when you aren't around. They miss your smile, that pep in your step, the way you light up a room just because you're in it. You're brave. You wake up everyday into the unknown. You don't know what's going to happen, but you show up. Your people appreciate this. I promise you that they do. So, Lovey, remember that. You are fricken awesome. You make our world go round. You are rocking this life of yours. Don't give up. Shine that light and show your spark. Show your brave. Love you, friend. Don't forget that either.